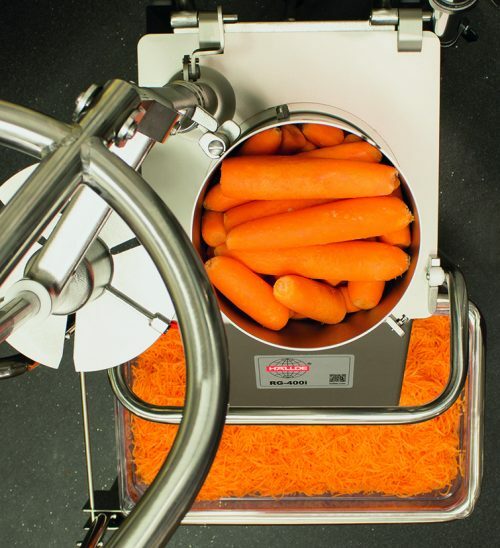 The RG-400i-3PH is Hallde’s largest and most effective Vegetable Preparation Machine that prepares very large volumes. The cutting tool range is broad – slices, dices, shreds, cuts julienne, crimping slicers and cuts french fries in a wide range of dimensions. There is a broad range of feed attachments and accessories, enabling adaptation to many different needs. 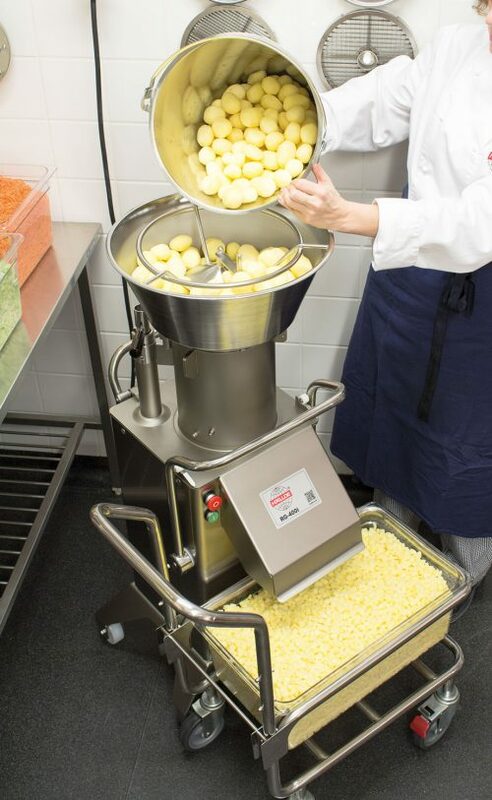 RG-400i-3PH is Hallde’s largest and most effective Vegetable Preparation Machine that prepares very large volumes, up to 3,000 portions/day or 2.4 tons/hour. The cutting tool range is broad; cuts, dices, shreds, cuts julienne, crimping slices and cuts French fries in a wide range of dimensions. There is a broad range of feed attachments and accessories, enabling adaption to many different needs. RG-400i is a floor model, with a compact shape, of high quality, manufactured in stainless steel, ergonomic and very easy to clean. 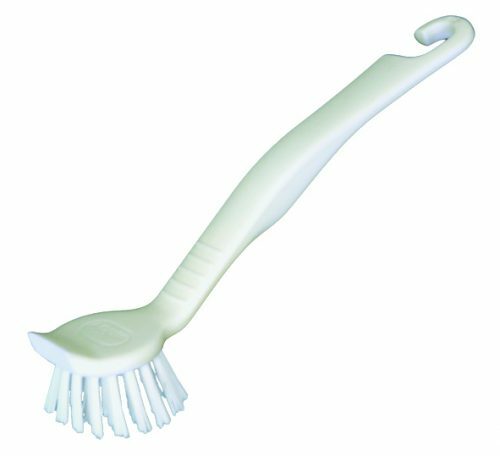 The cutting tools, feeders and accessories can be cleaned in the dishwasher. 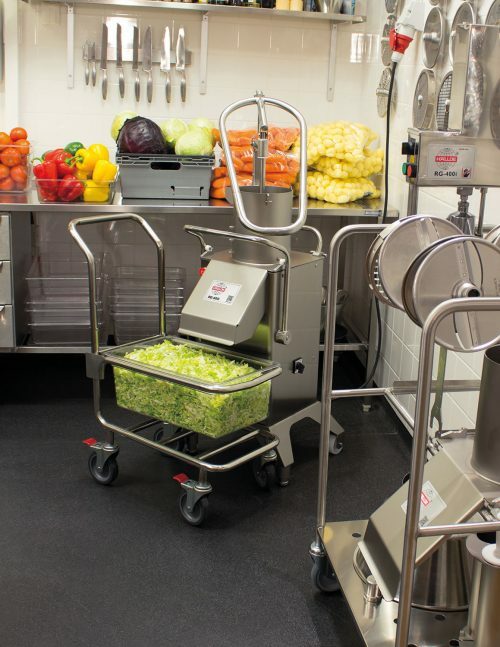 RG-400i fulfils all of the requirements that are placed on a professional Vegetable Preparation Machine independent of which environment it is used in: restaurants, large sized kitchens, industrial environments, catering or as a part of a production system. Food manufacturing capacity vegetable preparation. Make more than 50 different cuts. Slice, crimp, julienne, shred/grate, dice & potato chip. 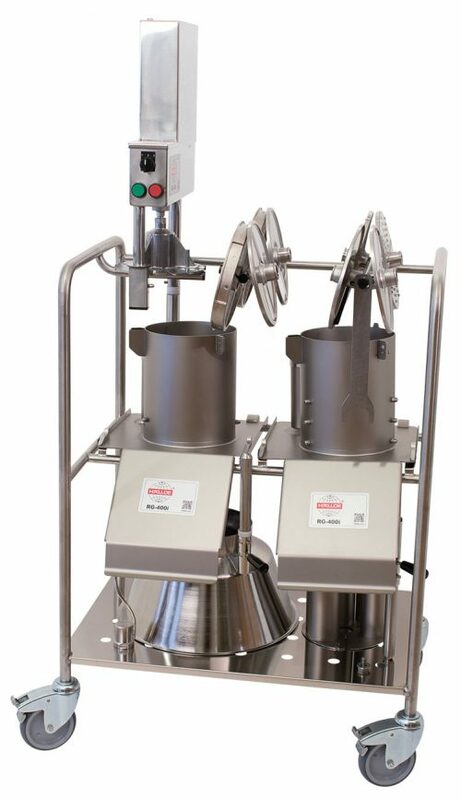 Processes up to 3,000 portions/day, 40 kg/minute or up to 2.4 tons/hour. 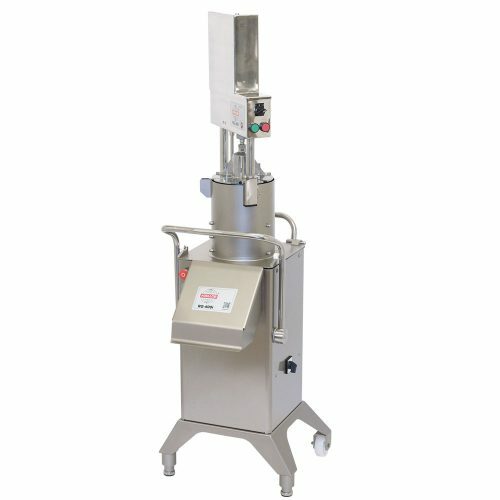 RG-400i-3PH has a broad range of cutting tools that cut, dice, shred, cuts julienne, crimping slices and cuts French fries in a wide range of dimensions and prepares both hard and soft products. 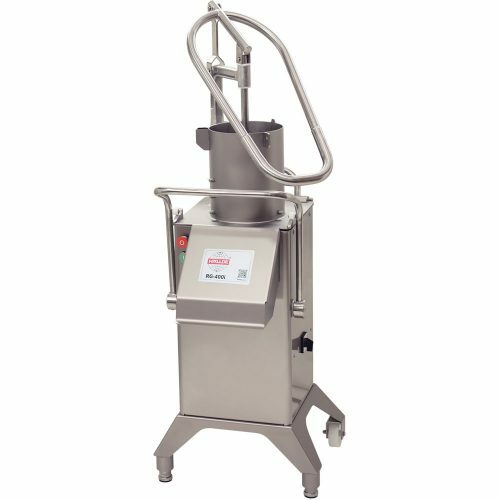 The cutting tool’s large diameter of 215 mm in combination with the spacious feed cylinders means that RG-400i-3PH can handle very high volumes at each fill. The rotation speed of the cutting tool is optimised to make even cuts as effectively as possible. The knives are ground according to purpose in order to retain their sharpness for a long time and are available as spare parts when it is time to replace them. 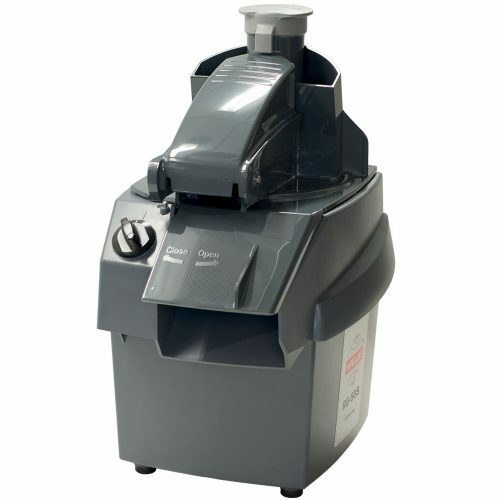 The machine has two speeds – 200 rotations/minute and 400 rotations/minute. 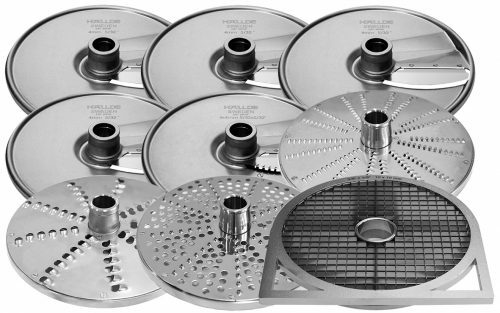 All removable parts are manufactured in stainless steel and can therefore be washed in a dishwasher. 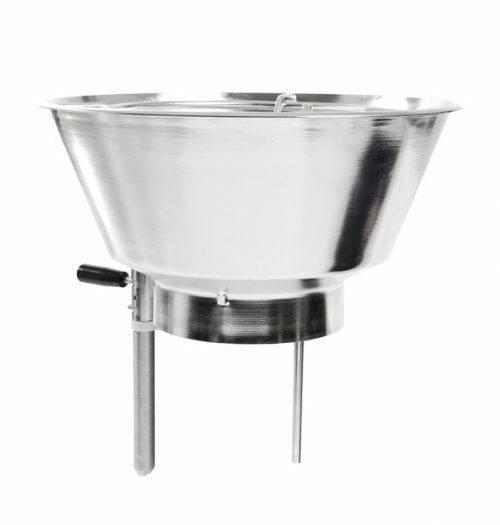 The machine base, also in stainless steel, has smooth surfaces, rounded edges and lacks unnecessary recesses into which food can penetrate and get stuck. 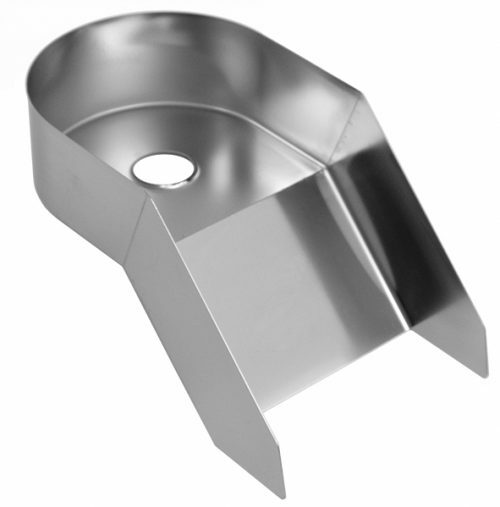 When the stainless removable tray is used, cleaning is facilitated even more because it can easily be taken out of the knife housing and cleaned in the dishwasher. In this way the machine base itself is kept free from the products that are being prepared. 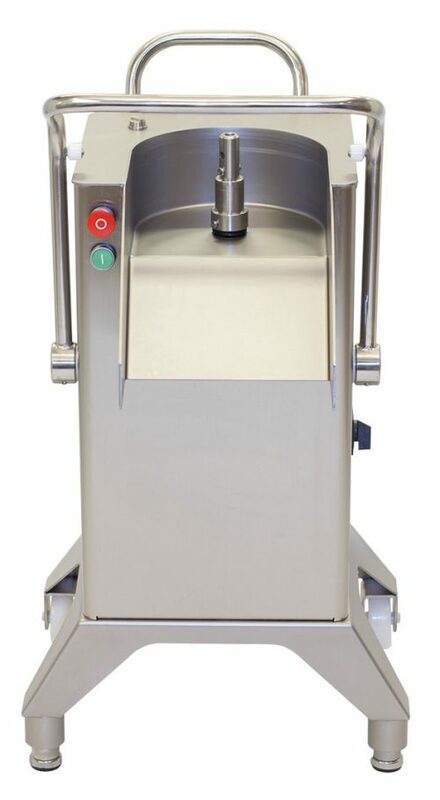 Thanks to the distance of 150 mm between the machine and the floor it is also easy to clean the floor under the machine. 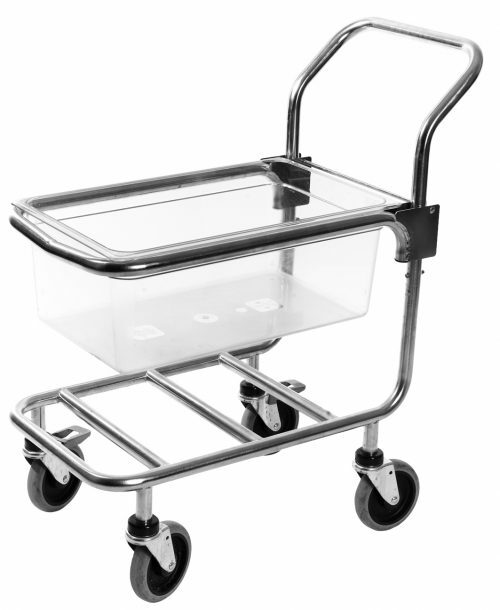 With help of the sturdy handle and the robust wheels on two of the machine’s legs it is easy to move. RG-400i-3PH is manufactured solely of food approved material. 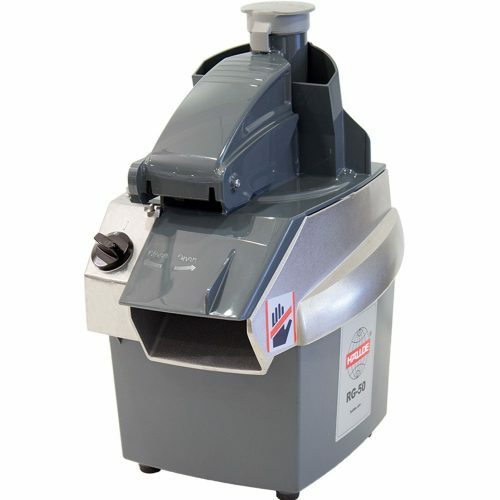 The RG-400i features two safety systems that prevent the machine from running when the cutting tool is unprotected. 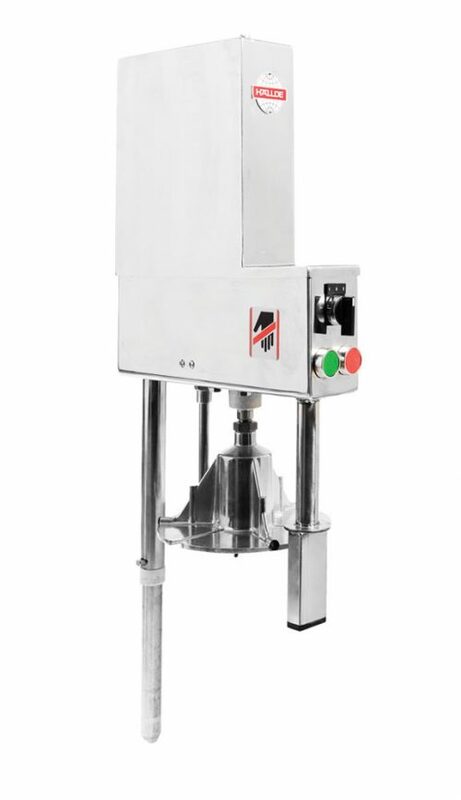 In order for the machine to start, the feed cylinder must be correctly mounted and the feeder must be in the right position and covering the cutting tool. The powerful motor is developed to be able to handle long and tough preparation conditions when the machine is used constantly during full work days, for example in a production system and also for repetitive preparation with many starts/stops. 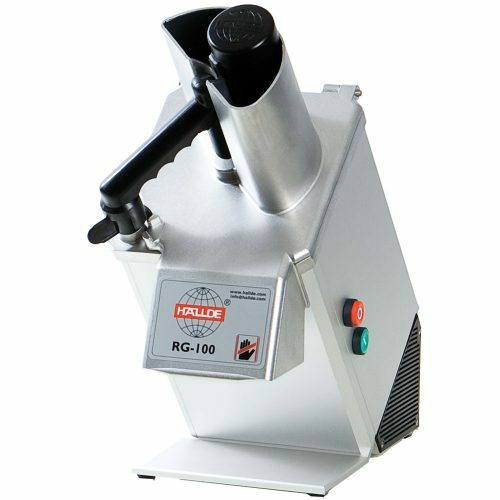 RG-400i-3PH has a high torque during start and operation and drives the cutting tool via a maintenance free gear drive made completely of steel. Here there are no intermediate belts that can wear or break, all in order to ensure the highest possible reliability. 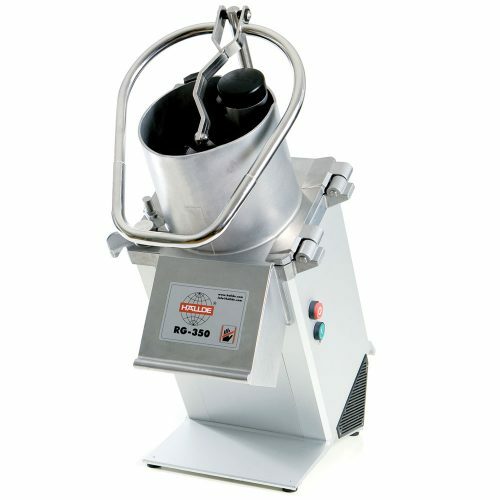 Enables continuous filling by the bucket for preparation of primarily round products. The capacity becomes very high because the machine runs constantly and is thus extremely time effective. 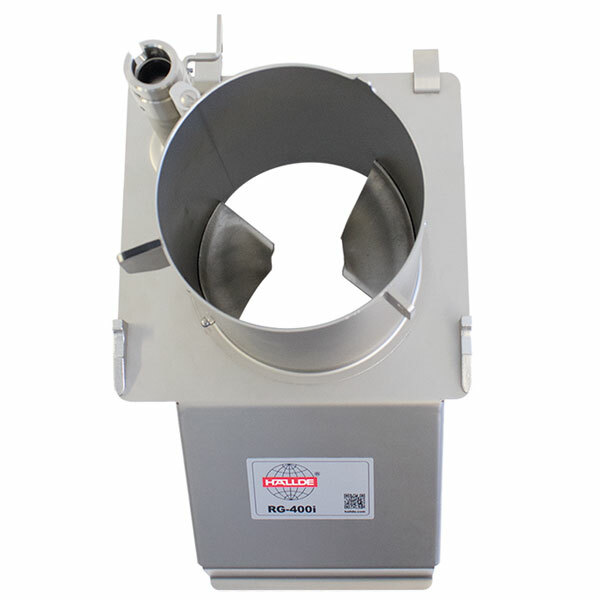 RG-400i-3PH with Feed Hopper can be strategically placed in a continuous production flow. Can prepare all types of products, both large and small. 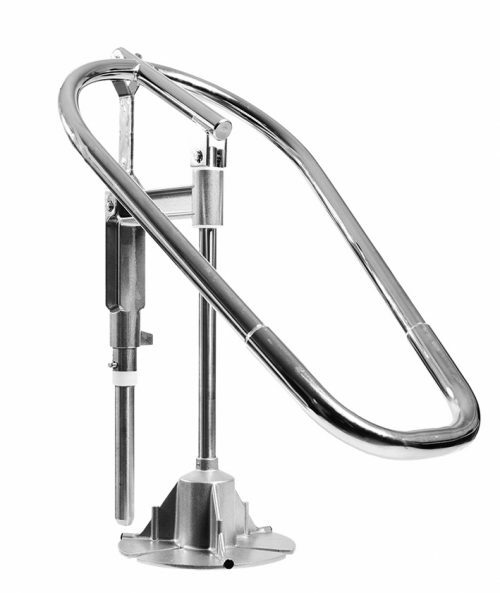 The Ergo-loop design gives a lever effect which also reduces the need for manual force when preparing large and hard products such as root vegetables, cabbage and cheese. For fast and safe preparation, the machine stops when the feeder is moved to the side and starts automatically when it covers the feeder cylinder’s opening. Can prepare all types of products, both large and small. 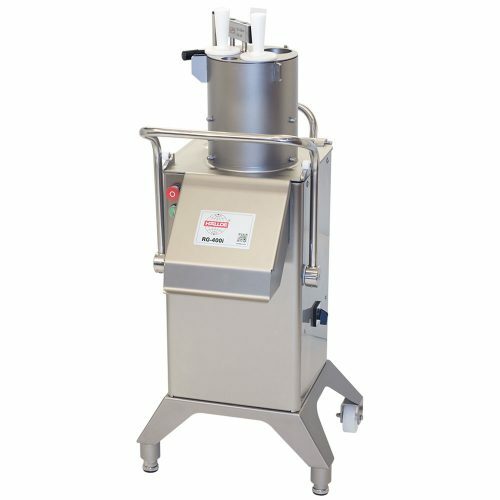 With the pneumatic feeder the product is pushed down automatically with just one push of a button. The workload and time spent are minimised and the feeder is therefore particularly useful when preparing larger quantities and when large and hard products are to be cut. 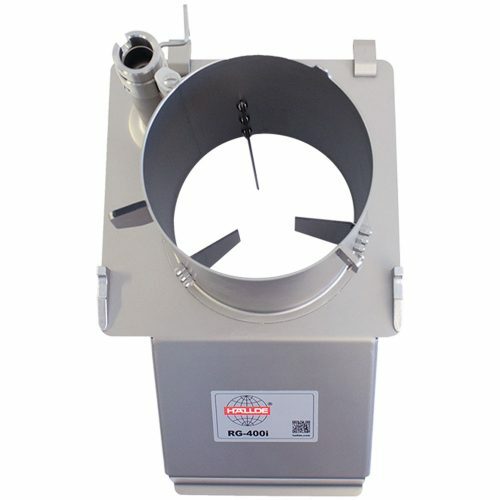 Just like the Manual Feeder, the cutting tool stops rotating when the feeder is moved to the side and automatically starts again when the feeder is swung back. The Pneumatic Feeder has three speeds that can be varied depending on what is going to be prepared. 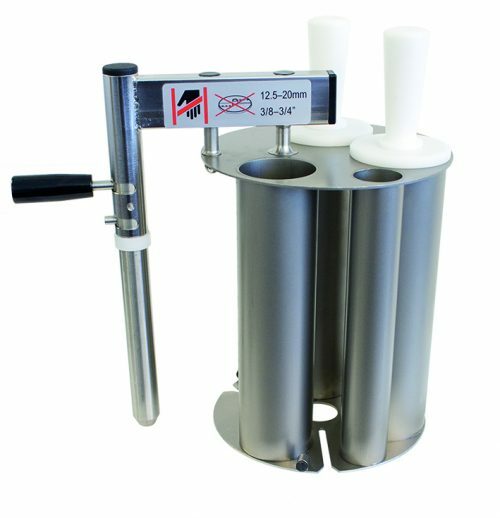 In order to easily be able to cut long and narrow products standing, and round products in a special direction, the 4-Tube Insert is used. The feeder has four tubes with the following diameters: 73 mm (two tubes), 60 mm and 35 mm. 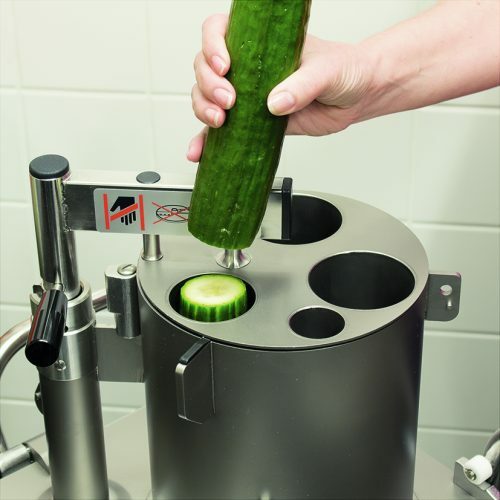 The tubes give good support for products in a range of different sizes, such as cucumber and leeks. In the tube it is also simple to “bunch together” herbs and parsley, etc. When the 4-Tube Insert is used the machine runs continuously because the rotating cutting tool is covered by the feeder at all times.